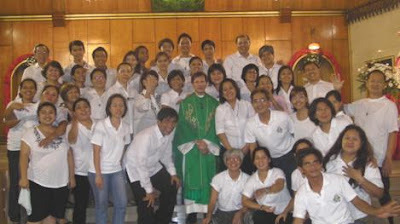 In May 2011, Fr. Bienvenido Luke Dobles, SLRP Parish Priest and PREX Spiritual Director gave his blessing to resume the PREX (Parish Renewal Experience) after a 1-year hiatus. Changes were incorporated to accommodate the new parish realities. The process of choosing the couples to make up the new PREX Secretariat was arrived at after intense prayer and much reflection. It took another month of prayer and reflection before these couples were finally confirmed. The Secretariat is made up of couples who are not new to parish work. In fact they already serve in different organizations in the parish in varying capacities. They have vowed to God to work as a team to commit to undertake the task of steering the PREX movement in SLRP in the direction set by Fr. Luke. The Secretariat is made up of Kuya Ed/Ate Bel Geronimo as Asst Chair-couple, Kuya Ed/Ate Hermie Chua as Treasurer, Kuya Peter/Ate LinaTamayo as Auditor and Head of the Food Ministry respectively, Kuya Joi/Ate Cecile Lumba as head of the Music Ministry and yours truly as Chair-couple. Immediately after the confirmation of the new Secretariat, the group, with Father, met every Wednesday for the next 5 weeks to prepare for PREX 92 which was slated for the first weekend of July. Each meeting began with faith sharing, an innovation introduced by Fr. Luke. Each team member was given a specific task to perform even as the team worked in unity and harmony to ensure the success of the seminar. The Secretariat adopted the practices that were effective in the past seminars and made adjustments in the schedule of the talks and activities to make each participant seriously go through the logical process of self-examination, understanding and cleansing and to become better Catholics. All the speakers and sharers were tapped from our parish. Valuable inputs, insights, experiences and support from previous PREX secretariats, from the immediate past Chair-couple Kuya Buddy/Ate Bing Lising and Ate Lulu Visaya helped make the transition smooth. All throughout, the Secretariat was guided by God’s love and the belief that the PREX is really a process of evangelization through a series of inter-related talks and sharing. As a result of the changes, fewer servants were needed during the 3-day seminar. The PPC, through its members, also assisted. The AP, BRC and LOM organizations led the prayer brigades while many other generous people contributed their time, talent and treasure. At the end of 3 days, Batch 92 produced 19 new graduates. The question now for the graduates is “What’s next after graduation?” We are happy to note that to-date most of the graduates are present in the weekly meetings as they prepare for the next seminar, PREX 93. They are now in the process of discerning where and how to best serve as active members of the SLRP community. With this, we are encouraging all our parishioners who have not experienced this seminar to come and join us and see God’s showering of love through the PREX. Our next seminar, PREX 93 will be on September 2-4, 2011.